This chickpea curry is so flavorful, yet so simple to prepare. Just a few minutes of prep and a press of a button on the slow cooker, and the next thing you know, the smell of curry is wafting through the kitchen. This dish is vegan, gluten-free, and immensely delicious. To build flavor without piling up dishes, everything is cooked right in the slow cooker – no stove-top browning or pre-cooking required! I use dried chickpeas for this recipe since they hold up better to the longer cooking time, are economical to cook with, and are so much more flavorful than canned. I don’t usually soak the chickpeas for this recipe ahead of time since the cooking time is so long that you don’t need to. If you prefer to soak your beans for any reason, your total cooking time will probably be shorter. Just layer diced onion and the chickpeas in the slow cooker, then sprinkle curry powder over top. Sweet potatoes, bell peppers, tomatoes, and coconut milk follow. I love how the sweet potato breaks down, adding body and a hint of earthy sweetness to the dish. I like to serve the steaming hot curry over a bowl of chopped raw spinach. The heat from the curry wilts the spinach perfectly as you stir it all together. I also love to add a nice squeeze of lime juice to wake the whole thing up and add some brightness. This dish freezes beautifully. I freeze in pint-sized Mason jars, so I have a single-serving, microwave-safe dinner ready to go! Just defrost in the fridge and warm in the microwave or on the stovetop. I prefer white-fleshed sweet potatoes for this recipe because they’re starchier and hold up better to longer cooking. If you use orange-fleshed sweet potatoes, they will break down a little more and make a thicker, creamier sauce — which is also good! You might think there’s not enough liquid in the pot to cook the chickpeas — resist the temptation to add additional water! The vegetables release a lot of liquid during cooking, which is typically sufficient for cooking the chickpeas. Check and stir the curry after 4 hours, or whenever you’re able, and add another 1/2 cup of water if the pot seems dry. This makes a curry with a thick tomato-y sauce. If you’d like a creamier, more coconut-y sauce, stir in a second can of coconut milk after cooking. To reduce cooking time, soak the chickpeas overnight, skip the extra water, and cook on high for 4 to 6 hours. I prefer white-fleshed sweet potatoes for this recipe because they're starchier and hold up better to longer cooking. If you use orange-fleshed sweet potatoes, they will break down a little more and make a thicker, creamier sauce, which is also good! 1 Combine the ingredients in the slow cooker: Drizzle olive oil in the bottom of a 6-quart or larger slow cooker then add onion and stir to coat. Pour dried chickpeas on top, then sprinkle the curry powder evenly over the beans. Follow with sweet potato, bell pepper, tomatoes, coconut milk, water, garlic, chili pepper (if using), and salt. Do not stir (leaving the chickpeas on the bottom and the sweet potatoes on top helps everything cook more evenly). Total cooking time will depend on your slow cooker and your chickpeas. The curry can be served any time after the chickpeas are soft and tender. It's also fine to if the curry cooks a little longer, or if you leave it on the "warm" setting for a while. The recipe is very forgiving! The curry will get thicker and creamier the longer it cooks. Garnish with cilantro and a squeeze of lemon or lime. Leftovers will keep for about a week or can be frozen for up to three months. Hello! All photos and content are copyright protected. Please do not use our photos without prior written permission. If you wish to republish this recipe, please rewrite the recipe in your own unique words and link back to Slow Cooker Chickpea Curry with Sweet Potatoes and Red Peppers on Simply Recipes. Thank you! Hi, Robert! One pound of dried beans makes about 5 cups of cooked beans. One can holds about 1 3/4 cups of beans, so I’d substitute 3 cans. Let us know how it works out! Meh…not the worst but I definitely wouldn’t make it again. I’m just sad that it took so long to cook (10 hours) and it made so much food. These are leftovers I don’t want to eat. Yes, chickpeas are al dente after 8 hours. Hi, Sammie! I’m so sorry that you didn’t enjoy this recipe! If your beans were still al dente after 8 hours of cooking, then that’s a sign that they were fairly old. Unfortunately, old beans are very hard to soften, and sometimes never totally soften. Try to buy your beans from a place that has good turnover of dried beans; it’s not fool-proof, but I find this does give you a sign fresher beans in the store. Better luck next time! Mine turned out pretty dry. I added about a 1/4 cup of water at the end but it needed more. Furthermore, the chickpeas were al dente after eight hours in my slow cooker which usually runs hot. Thanks for the feedback, Stephen! 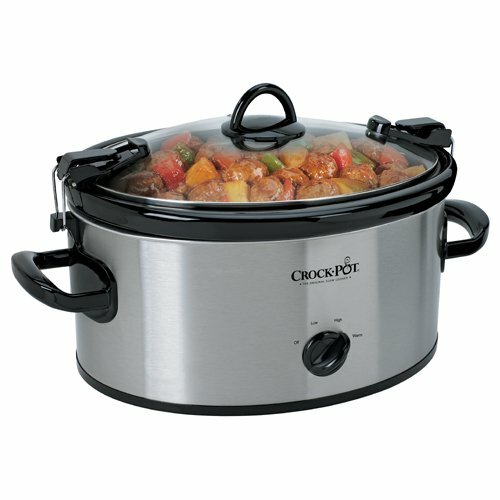 It sounds like your slow cooker runs a little hotter than ours, which accounts for the extra evaporation of the liquid. Currently in the slow cooker and it’s taking forever for the chickpeas to go soft . I used butternut squash instead of sweet potato and it is delicious. I would just perhaps soften my chickpeas first next time or use canned. Easy to follow & full of flavour though. I made this recipe today and it was my first time trying curry. It was delicious. I plan on making it many more times and filling my freezer with it too. I made this recently and enjoyed every bite of it. My grocery store does not carry dried chickpeas, so I subbed two cans of chickpeas instead, but waited until the last 3 or 4 hours to add them to the crock pot so they wouldn’t get too mushy. Otherwise, I followed the instructions, and it turned out fantastic. The flavors are uniquely intriguing, but not overpowering. I am a night-shift nurse, so I love when I find a recipe that is easy to put in the crockpot in the morning before I go to bed, and will be ready to eat for dinner before I leave. Plus, it’s a huge bonus if it makes enough to last a few days so that I have a stockpile of healthy meals for myself to get me through the work weekend without eating hospital cafeteria food or eating out.This recipe easily fulfilled both criteria, and for that reason, it’s earned its place in my regular rotation of recipes. I made this yesterday and I don’t have a slow cooker, and it still turned out really well! I used all the same ingredients (subbed canned chickpeas for dried) and made it the same method I would make a chili. So good! Thanks! this looks delicious. I prefer cooking beans and lentils in my instant pot. So you have a instant pot version of this? Hi, Karen! We haven’t yet developed a version of this recipe for the pressure cooker. If you give it a try on your own, please let us know how it turns out! This is so good! I used a jalapeño and it gave good flavor really no heat. At 7 hours I had a bowl but the garbanzos were a little more firm than I like. However I couldn’t help myself and gobbled it down. So good! I did add another 1/2 cup of water because I wanted the chick peas to absorb more. This does NOT have a hit-you-over the head curry flavor and is just super scrumptious. This recipe has excellent flavor! But, the chickpeas and sweet potatoes never did soften up to my liking even when I turned the crock pot on high for a couple hours after 8 hours on low. By then the flavor was not as good as when I tasted it at the 4 hour point. I will try heating the dried chickpeas and sweet potatoes to a boil for a few minutes and allow to rest off the burner overnight before draining and following the recipe next time it is made. Surprisingly good flavor for such a simple curry. Will try it again! We made this a couple of days ago, and followed the recipe. Used dried chickpeas and wouldn’t consider using canned as it turned out fabulous. Took about 7 hours. Chickpeas still had a bit of crunch, which I think is the way it should be. Used 1 tbs. madras curry and 1 of more mild curry. Still had a bit of heat, which we balanced with a dollop of greek yogurt.. Overall, it was terrific. I plan on making this tomorrow. If I soak the chickpeas in advance, how much water do I soak them in? Do I then just strain out the water and proceed as per recipe? If I decide to not soak, I just rinse well? Do I need to add any water or is the juice from the tomatoes and the coconut milk enough liquid to cook the chickpeas? Hi, Debbie! If you soak the chickpeas in advance, just put them in a bowl with enough water to cover by a few inches. Drain the chickpeas and continue with the recipe, though your cooking time will be shorter so begin checking the stew after 3 or 4 hours. If you don’t soak, then yes, just rinse the chickpeas. In testing, we did not need any additional water; the tomato juice, liquid released from the vegetables, and coconut milk was enough. However, if the pot seems very dry when you check it after 3 or 4 hours, then add a half cup of water. Enjoy! These look fantastic. I love Indian curries. Is the sauce supposed to be slightly curdled, like it looks in the top photo? Hi, nvrm! Yes, the sauce does look slightly curdled when you first lift the lid. Just stir it all together and the sauce will come together. Even so, it’s not intended to be a super smooth, creamy sauce; it’s more of a thick sauce, like tomato sauce. You are right, chickpeas are easy to prepare and the dried ones have more taste than the canned version. Your curry makes my mouth water. Even though I cook mainly Italian food I really love curries from time to time. I’m going to try this out tomorrow night, as I and my family are out all day, yet I am still on deck of dinner. If this works, Sabrina, I will be both amazed and grateful. I have long wanted to do more with dried beans, but canned ones are so much more convenient. I’m a little skeptical that the chickpeas will cook, but I will be very happy if they do because I love both chickpeas and curry! Hope it turns out to be a smash hit! Looks fantastic! Would cubed butternut squash work instead of sweet potato? And how about reduced-fat coconut milk? I think butternut squash will break down more quickly, but as noted in the recipe, that could be good too– making a thicker sauce. That thicker sauce could also be helpful if you’re using low-fat coconut milk. If you try those modifications, please let us know how they turn out! Hi, Marguerite! Yes, I believe cubed butternut would work just fine in this recipe. I’m not 100% sure about the reduced-fat coconut milk — I think it would work, but your sauce might be a little soupy. If you try it, let us know how it works out!